From left to right: José Antonio Arias, chief innovation officer of MAPFRE; Antonio Huertas, president of MAPFRE, and Josep Celaya, global director of Transformation. 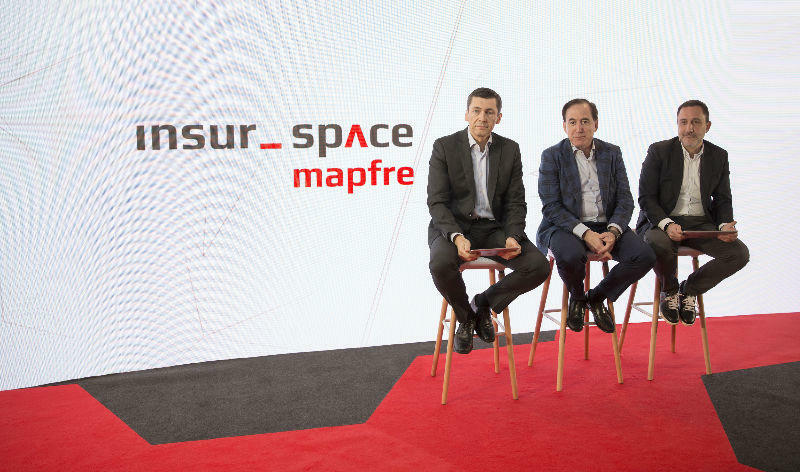 Today MAPFRE unveiled insur_space, its new insurtech startup accelerator, which is based in Madrid and has been created with the aim of developing new solutions to meet the needs of the different client types, which can then be incorporated into MAPFRE’s strategic business over a mid-term horizon. insur_space is one of the pillars of MAPFRE Open Innovation, the innovation platform the company launched this year to drive innovation both at MAPFRE and within the insurance industry. “Our objective with MOi” explained Antonio Huertas, chairman and CEO of MAPFRE, during the presentation of the new space, “is to become a global benchmark in innovation in insurtech and to progress toward the new business models and solutions emerging from the digital and technological changes we are witnessing”. With this in mind, MAPFRE will allocate more than 100 million euros each year to the development of innovative insurance-related solutions, which when combined with the more than 600 million-euro annual technology investment, thereby ensuring that the company is adequately positioned to tackle new challenges and transform its value proposition. MAPFRE Open Innovation combines a set of innovation and transformation levers through two main elements: Strategic Innovation and Disruptive Innovation. A Transformation and Innovation Committee has been created to coordinate and oversee MOi, headed up by MAPFRE’s chairman and CEO. This committee will define the main courses of action, design related projects and monitor and oversee their execution. At the helm of MOi is José Antonio Arias, chief innovation officer for MAPFRE. insur_space falls within Disruptive Innovation, which is led by Josep Celaya, global head of transformation at MAPFRE. This new active collaboration space facilitates the development of new ideas, concepts and products, and will conduct pilots and tests, all under the mentorship of MAPFRE experts, with access to real data from our international markets. The program reflects MAPFRE’s commitment to developing disruptive solutions that generate a positive impact on our business and on society. Disruptive innovation also includes a collaborative model with universities and business schools for the joint development of innovative projects, as well as an investment vehicle for teaming up with private equity companies that invest in innovation in the insurance world. In connection with this, MAPFRE recently announced its participation as an anchor investor in the “Alma Mundi Insurtech Fund, FCRE” private equity fund, focusing exclusively on the insurtech space, in which MAPFRE will invest 25 million euros. The decision has also been taken to integrate CESVIMAP into MAPFRE Open Innovation. For some years now, MAPFRE’s Center for Experimentation and Road Safety (CESVIMAP) has been a global benchmark for research into vehicular damage accident repair methodologies.